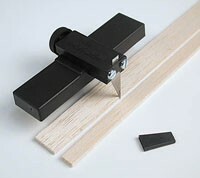 Save time and money cutting accurate balsa strips up to a width and thickness of 20 mm (3/4"). Make minute adjustments with the finely threaded adjustment screw, one full turn equals a 0.6 mm (.024") change in width. Uses inexpensive #11 PROEDGE knife blades.